Right, this build is going much slower than I'd planned. It's really down to the number of modifications I keep making! Some of the mods I think will be straightforward are taking more time than I thought and the various handles are a case in point. 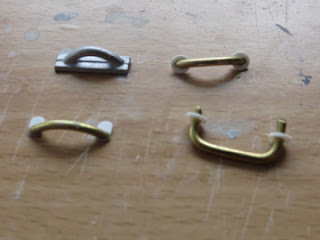 I decided that the white metal handles with integral bases were not really as good as I would like. Especially when compared with the etched metal bases and wire versions from the Trent kit. Don't get me wrong, I understand MS need to keep the cost of the kit down, so some compromises are necessary. One thing to note, is that the handles seem to vary a little from boat to boat and from the RNLI plans. I didn't have enough photos of the Padstow boat I'm modelling, so have had to take a guess based on other photos I have from the early Tamar boats. 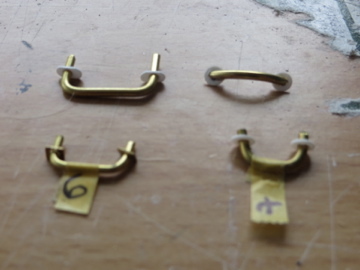 The handles were all made from 2mm brass rod, save for on the escape hatch, which was 1.6mm. The bases were made from 0.5 mm styrene; either discs cut with my punch or from 3.2mm strip. Again the escape hatch was an exception using etched parts from the Trent kit. What took the time was accurately drilling the holes in the bases and filing them to accept some of the handles. The may have taken some time, but I'm please with the results. Now, what's next?